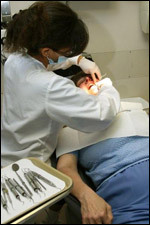 Our Services - General and Cosmetic Dentistry from James S. Begley, D.D.S. Bonding, cosmetic Contouring, Crowns and Bridges, Specially Denture, Cosmetic Fillings, Implant Restoration, Whitening, Sealants ,Extractions, Scaling and Root Planing, Dentures, Cosmetic Dentistry. Your initial oral examination includes a visual examination, charting, periodontal probing, diagnosis and treatment recommendations. We will also take a full series of x-rays, which includes the x-rays for the proper diagnosis of the anterior (front) and posterior (back) teeth as well as the bite-wing x-ray series for proper diagnosis of proximal decay of posterior teeth. We have a continuing special relationship with several Endodontists if you require root canal treatment. Whether you are an athlete or casual sports participant, you should wear a mouth panoramicguard to protect your teeth. If you grind your teeth while you sleep, a bite guard will help reduce symptoms of TMJ. We custom make mouth guards in both soft and hard materials. We offer a range of specialty dentures.